Life (2017. 1 hr, 39 min, 43 sec) is a science fiction horror movie, directed by Daniel Espinosa (Safe House (2012), Child 44 (2015)) from a Rhett Reese, Paul Wernick script. The plot of the film follows the same narrative lines which were so ably laid by Alien (1979) and it is surprising how little this subgenre has moved on given that Alien relied heavily on The Thing from Another World (1951) for its overall structure. So, we have a bunch of scientists who should know better, playing around with their single cell creature, trying to get it to grow. There is initial wonder as the cells divide with the discovery that each cluster is simultaneously eye, muscle and brain tissue, making the creature almost impossible to kill. Presumably the film takes place in its own pocket universe where no one has ever made a horror film. This small fact does not deter our intrepid and yet surprisingly stupid scientists, as they continue to think it a great idea to see how big it will get. It does not take a doctorate to realise that they will soon be so much man in a can fast-food for Calvin, yup they even named the little blighter. What follows is the inevitable who gets to play the next victim game as the crew make one stupid mistake after another. The film suffers from a number of inherent problems, taken on its own it provides a suspenseful ride, but you can’t but help feel that it lacks a levels of originality, a singular voice of its own. The shots of the Earth and the destruction of a space station have already been covered in Gravity (2013) and the overall plot is dated. There is little time to either get to know or care about the scientists fates, I certainly gave up after the first attack when they open the door to the sealed lab in order to rescue a crew member and thereby guarantee Calvin’s subsequent escape. That is not to say that the film isn’t well acted. 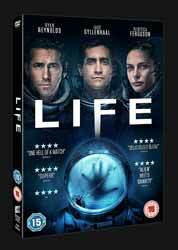 Jake Gyllenhaal (David Jordan) turns in a good performance as a man so sick of humanity that he would rather remain on the space station regardless of his radiation count. Hiroyuki Sanada (Sho Murakami) also stands out from the pack as a new father, which gave some of his desperate acts validity and Ariyon Bakare (Hugh Derry) is able to elicit empathy from the audience as a character whose legs are useless on Earth, but in space he can fly. The three remaining leads, Ryan Reynolds, Rebecca Ferguson and Olga Dihovichnaya either do not have enough screen time or back story for us to consider them other than red shirt fodder. On the plus side the design of the alien was good as it did not rely on the old, man in a suit, trope. Its movements were quick and agile enough to provide a couple of good jump scares as well as the occasion chase. The film also has a rather neat twist in the ending. There is a good selection of extras, starting with six small Deleted Scenes (5 min, 35 sec). Life: In Zero G (6 min, 38 sec) with the cast and director covering how the film achieved the feeling of zero gravity. Creating Life: The Art and Reality of Calvin (6 min 51 sec) has the director and various expert talk about how they came up with the creature. Claustrophobic Terror: Creating a Thriller in Space (7 min, 10 sec) on how they created tension in the film and lastly, you have the Astronauts Diaries (2 min, 54 sec) has the cast in character making diary entries. So, overall not a bad film, but not a film which brings anything original to the table.